Most of the icons in this pack are for units and structures that are normally unbuildable. The other icons are made from various C&C renders and are, well, just generally better looking than the normal ones. 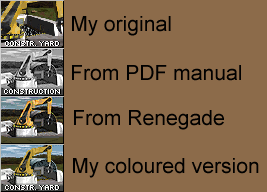 The construction Yard icon is taken from the C&C95 PDF manual. Since it was in greyscale there, I recoloured it. The repair bay icon is made after the render in the original DOS manual, where there is a Nod logo on it. The Visceroid icon is also taken from Sole Survivor, but edited by me to correct the spelling mistake in the text. The SS original says "Viceroid" instead of "visceroid". The Technology Center icon is based on a video in RA where it's used as prison. Very, very nice job there, Dude... I'm going to use these. That Ion Cannon cameo has been created so many times in exactly the same dimensions. Oh well, the more, the merrier. Deluxe pack indeed, Nyer. Great job. Mind if ES hosts these? These are very good Nyerguds. I could swear I've seen that gunboat cameo before..
C&C95 has a gunboat cameo. This one is simply better. Note that I didn't make a hovercraft icon - C&C95 already has that too. But the hover icon looks nice. On the gunboat one the boat itself is too small, with a quarter of the image taken up by a stupid rock. And now, before anyone notes that the Mobile HQ icon is the same as the RA radar Jammer icon, you're WRONG. First of all, the actual render used for the RA radar jammer was a render of the MHQ in C&C1. And the RA icon is a mirrored version of that render, while this is the original. ES being the Editing Source. And yes, I know it's dead atm, but soon it'll get revived. So, can I upload them please? I never knew the MHQ and the Radar Jammer were the same thing. Cool, yet still lazy WW. I prefer finishing the pack before getting it hosted on other places. And that means including a decent hospital and chemical lab icon. Those are some awsome cameos. Great work! Get somebody with talent to model the building and create a render for you. ie. Gangster and/or Holy Master. Ari could do it, but we're not into remakes. I never knew that of the Ion Cannon cameo. Interesting. I think TS uses the same cameo (slightly edited) too? yeah... I immediately had the impression it looked more like the TS one after I fixed it. I think your new Ion Cannon icon has a bit weird perspective (coming from rotating the original image, as it seems). Any idea how to fix that? Perspective? It's in fricking space, and there's no background! Put Earth in the background maybe ? and fire the ion-canon on the moon? Look at the solar panels of the cannon. Their shape seems somewhat weird for sure. Well, you have to understand the satellite is not viewed from below, but slightly from above. Also note that there's no symmetrical relation between the satellite and the solar panels, since they rotate. I just follow the basic formatting, darkening and text placement rules used in the other icons. Personally, I don't see how so many people get that stuff wrong. 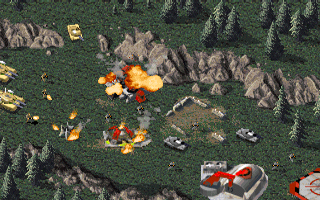 Do note, the dinosaur and visceroid icons are just taken from Sole Survivor. I didn't change anything on them except fixing the visceroid's name. since this topic is back alive, i think the technology center cameo should read "Tech. Center". It's shorter and fits better into the small cameo space. An alternative reading "Prison" might be useful too. Not to mention, I already put that in my 1.06 patch, so it's not even really necessary to add it in this collection anymore. Nice bump... was searching for this topic earlier today, couldn't find it on my own, thanks. Ridiculous 3-year bump: I finally made work of that bio-lab icon, by doing a 2x upscale of the bio lab sprite using pixel art upscaling algorithms, and then touching it up a little at the edges. But wasn't there a bigger WW render of the entire building available, which you could have used? It might be better to replace the grey background with grass or something so that it'll fit in better with the cameos of other structures. nice cameo tomson, it looks like an HD DOS cameo. Abit offtopic, but has anyone ever made the Nod repair bay (one with NOD logo in the middle)? Oh wow I never knew the Repair Bay was meant to open from the middle. Maybe it was originally intended to be something else, like a missile silo? That would explain the warning stripes. Also, interestingly, it had some kind of target symbol in the middle in this beta screenshot. Also, interestingly, it had some kind of target symbol in the middle in this beta screenshot. I had that one as jpeg for quite a while before Hallfiry got me an uncompressed image, from a magazine showcase CD. Sadly it was pasted on one pic with three other 320x200 images, and then stretched to 640x480. Took me a while to resize it exactly back to its original pixely goodness. As for it opening in the middle, that pic is just from the Strategy Guide. Not too hard to find on ebay these days.